Ethan Kaplan strikes again. The always-thoughtful (and thought-provoking) former recording industry tech exec has put up a blog post that not only explains why Turntable.fm is so popular, but also reframes why the record labels have failed to embrace almost every cool new internet service. You should read the whole thing, but the short version is that users care about the experience, the big labels care about the legal rights. And it's really the experience that makes things valuable. But, if you (like the labels) have bet on the licenses, rather than the experience, then any time someone else makes the experience more valuable, all it does is highlight just how little value there really is in the licenses. Value in the music business though is an odd thing: the more value added to the music by the fan directly, the less influence the rights holders have over it, and the more influence the creators of representational systems (i.e., turntable.fm) and rights creators have (i.e., artists going directly on turntable.fm with stuff that their labels don�t own). And rights holders do not like being taken out of the value equation. Call it Kaplan�s Law: the more value a non-music company adds to the fan/artist relationship, the bigger the threat to those who�s business depends on being between the two. To some extent, this is a (better) rephrasing of a point I tried to make a few years ago, that those who focus on "copyright" as the key to success in any industry are using copyright as a crutch. Rather than building real value and business models that users want, they're using this crutch which provides a simple business model. It makes them lazy, uncreative, uninterested in real user value -- and violently against any sort of innovation that increases value while diminishing the importance of that crutch. The really interesting points are when you remove that crutch and realize that for a business model to work, it has to provide real value that willingly brings users in. Until the music industry figures this out, they're going to continue to miss the boat on important innovation on both the product side and the business model side. To artists: own your experiential rights. Participate in technology and hold your representatives (lawyers, labels and management companies) to the standards you want your content held to once you lose control of it. Ian Rogers, from Topspin, has an absolutely fantastic blog post on the question of "unbundling" and "rebundling," in the music business. What kicked it off was David Pakman's writeup about how unbundling the album into songs that can be purchased individually may have had the biggest impact on the record labels' bottom lines -- much bigger than unauthorized file sharing. It goes on to talk about the economic impacts of unbundling in a variety of industries. It's a good read. We've seen this before. And, obviously, I've spoken about this for years now. There are all sorts of opportunities, and those opportunities often come in recognizing how to best bundle scarce and non-scarce goods. This is why I think it's important to recognize the differences between what Pakman is talking about and what Rogers is talking about. Pakman's discussion on unbundling is focused on taking apart artificial bundles that were put together due to the inefficiencies of the technology at the time. You put a bunch of songs together on an album so you could distribute (and sell... and promote) them all together in one shot. What Rogers is talking about, however, is a more natural bundle. Rather than a bundle borne out of the inefficiencies of existing technology, the bundling he's talking about is bringing together natural bundles of products that fit together smartly in packages that give fans real options -- and which are done for the overall convenience of fans and buyers, not the convenience of retailers and middlemen. That's a key difference and we're going to see more and more of it in a variety of industries. The bundles that will disappear are the bundles that were done to help serve the middlemen, and what will replace them (much more profitably and economically efficiently) are bundles that help serve the end user/buyers. When a label executive tells you that they are "not in the business of selling discs", (or vinyl, tape, t-shirts, etc.) and that they are actually "selling music," they are, at best, fooling themselves, or at worst, lying to your face. Moving plastic, vinyl, paper and/or any other tangible good they can dream up is exactly what the recording industry has been about since it was established. Sure, the labels spend money and time trying to infuse their products (CDs, posters, etc.) with content (music, album art, etc.) to raise its intrinsic value, but it's still the CD or poster that they are/were selling... not the music itself. He goes on to note that music is really an experience, and people should stop focusing on copyright law or the idea that file sharing is "stealing," and focus on the overall experience and building models based on that. Of course, he doesn't quite get into the difference between a service and a product -- and it's one area that people sometimes get confused about, so one way to simplify it is to think of it like this: a product is a single thing created in the past that you now own. A service is paying for something to happen in the future. It's not a perfect explanation, but in my experience, this simple distinction often gets people thinking creatively about how to turn a business model into one focused on selling a service, rather than a product. Obviously we'd love for anyone who has our music to buy a copy. But again, we're realistic enough to know that most music can be found online for free. And trying to block people's access to it isn't good for bands or music. If music is going to be free, then musicians will simply have to find alternative methods to make a living in the music business. People are spending money on music, but it's on the technology to play it. They spend hundreds of dollars on Ipods, but then fill it with 80 gigs of free music. That's ok, but it's just a different world now, and bands must learn to adjust. Our videos have opened up many more opportunities for us to make the things we want to make, and to chase our best and wildest ideas. Yes, we need to figure out how to make a living in a world where people don't buy music anymore. But really, we've been doing that for the last ten years. Things like licensing, touring, merch, and also now making videos through corporate sponsorship have all allowed us to keep the lights on and continue making music. For a decade, analysts have been hyperventilating about the demise of the music industry. But music isn't going away. We're just moving out of the brief period--a flash in history's pan--when an artist could expect to make a living selling records alone. Music is as old as humanity itself, and just as difficult to define. It's an ephemeral, temporal and subjective experience. These days, money coming from a record label often comes with more embedded creative restrictions than the marketing dollars of other industries. A record label typically measures success in number of records sold. Outside sponsors, by contrast, tend to take a broader view of success. The measuring stick could be mentions in the press, traffic to a website, email addresses collected or views of online videos. Artists have meaningful, direct, and emotional access to our fans, and at a time when capturing the public's attention is increasingly difficult for the army of competing marketers, that access is a big asset. Now when we need funding for a large project, we look for a sponsor. A couple weeks ago, my band held an eight-mile musical street parade through Los Angeles, courtesy of Range Rover. They brought no cars, signage or branding; they just asked that we credit them in the documentation of it. A few weeks earlier, we released a music video made in partnership with Samsung, and in February, one was underwritten by State Farm. We had complete creative control in the productions. At the end of each clip we thanked the company involved, and genuinely, because we truly are thankful. We got the money we needed to make what we want, our fans enjoyed our videos for free, and our corporate Medicis got what their marketing departments were after: millions of eyes and goodwill from our fans. While most bands struggle to wrestle modest video budgets from labels that see videos as loss leaders, ours wind up making us a profit. The unsigned and unmanaged Los Angeles band Killola toured last summer and offered deluxe USB packages that included full albums, live recordings and access to two future private online concerts for $40 per piece. Killola grossed $18,000 and wound up in the black for their tour. Mr. Donnelly says, "I can't imagine they'll be ordering their yacht anytime soon, but traditionally bands at that point in their careers aren't even breaking even on tour." The point, Kulash, notes, is that there's a lot of things a band can sell, focusing on "selling themselves." And, the thing he doesn't mention is that, when you're focusing on selling the overall experience that is "you" as a musician or a band, it's something that can't be freely copied. People can copy the music all they want, but they can't copy you. "You" are a scarce good that can't be "pirated." That's exactly what more and more musicians are figuring out these days, and it's helping to make many more artists profitable. And, no, it doesn't mean that any artist can make money. But it certainly looks like any artist that understands this can do a hell of a lot better than they would have otherwise, if they just relied on the old way of making money in the music business. Back in college, I took a lot of statistics classes -- and I did pretty well in them, but it wasn't until I was well into a pretty high level stats class that I finally started to understand statistics, and it had nothing to do with the class or the teacher. It had to do with the job I'd taken as a stats tutor for six different intro stats classes (and, eventually, that resulted in teaching a full class on stats to incoming freshmen). What I realized is that as useful as the book learning and problem sets and everything was, it wasn't until I had to actually explain something back to someone who really didn't understand it, that I finally started to really understand the more important aspects of statistics. I couldn't get away with "well, I understand this because it works." I had to so fully understand statistics that I could actually understand questions that came from way out in left field, and try to figure out how to fit them back into the framework that was being taught. It was a valuable lesson. In talking about the future of journalism, one point I've made repeatedly, is that news organizations need to realize that their community is their best asset, and they need to cater to them more and involve them a lot more in the process. Today's news "consumer" isn't really a consumer, but a participant. I've talked about how they want to share the news, write the news and comment on the news, but what about actually experiencing the news in some manner? Whether on purpose or not, it seems like that's what Wired just accomplished with its ambitious Vanish project. If you haven't paid attention to it, it started with an article last month in Wired, called Gone Forever: What Does It Take to Really Disappear?, written by reporter Evan Ratliff. The article itself was quite an enjoyable read, about people who have simply tried to disappear and start a new life (and the difficulty of actually vanishing from your old life). Despite the topic (and the fact that I love such stories), I probably would have skipped the article over. There's only so much time and so many things you can read in a daily basis -- and (as you might have guessed) I already read a lot. But, Wired combined this with a contest. The reporter on the story, Evan Ratliff agreed to "vanish" himself for a month, and the contest was to see if anyone could find him. If someone found him and said the word "fluke" to him, Evan would respond with a codeword that would allow the "winner" to alert Wired's Nicholas Thompson and claim a $5,000 prize (including, I believe, Ratliff's own $3,000 for writing the article). That certainly made the story a lot more compelling. I have to admit that I didn't participate much in the "chase" which was tracked in a variety of places online from Facebook to Twitter to the Vanish blog on Wired, which dropped clues and tied together some of the findings. On Tuesday, however, Ratliff was caught, down in New Orleans, by the operator of a pizza shop, who had been alerted to the whole thing just a day before by someone who had been very closely tracking Ratliff, and used some rather creative means to track him down -- including befriending some people who were alerted to Evan's whereabouts without even realizing it. You can read the full explanation from Jeff Reifman as to how he tracked down Ratliff, or Wired's shorter summary of the story. In the end, Ratliff left a lot of clues, but he did so purposely, to help illustrate typical mistakes made by those who do try to "vanish" for real. However, what struck me, was just how involved the community got in this story. It reminded me of the revelation of learning statistics by teaching it -- and has me thinking more about "experiential" reporting on "reporting by game" to better involve a community in various projects. I am not suggesting that "this is the future of journalism." But I am saying it may be one potentially useful way that some stories could be told. For many people involved in this project, I'll bet they learned a hell of a lot more about this issue than they ever expected. And even those of use who were "casual observers" picked up a ton of interesting knowledge about how people try to vanish -- and (perhaps much more interesting) how others track them down. If I were looking to make journalism more interesting, I'd start looking at ways to more creatively involve a community, and Wired's Vanish experiment is one to keep in mind as an example. As noted, I'm at the Leadership Music Digital Summit to give a keynote talk tomorrow. Today's keynote is from Rio Caraeff, the executive VP of the eLabs group of Universal Music Group. Listening to his talk, it's impressive to see that it appears someone within Universal Music Group actually seems to understand what's going on. That may seem a bit dismissive of Universal Music Group, but it's not my assessment, but what the CEO of Universal Music Group flat out said just a couple of years ago, in noting that he had absolutely no clue about digital music and didn't even know how to hire the right people. Caraeff, however, seems focused on all the right things. He talked about how access to music is more important than possession. He talks about how it's the experience that has always made music valuable, noting "you can't steal experience." In fact, he points out that the concept of the album is dead, but that UMG (and others) need to build a true "living album" that goes beyond the music: adding a full experience that can update over time, that allows fans to access the music however they want, and that enables interaction with that music -- including fan participation and user-generated content associated with the music. And he wants it all built on open standards, to avoid a situation like the Blu-ray consortium where only a few companies have control of the system. "How do we compete with piracy? It's creating a unique experience that can't be easily replicated through file sharing." He then goes on to say that the business of "licensing music" is a dead end because it's just not scalable (whoo hoo!) noting that it's killing innovation. Even saying that they need to acknowledge that they need to enable letting a thousand innovators bloom. "I'd rather have access to all my music, tv shows and movies anywhere on any device, rather than "own" 100 files. This is going to be a swift transition. It's taken us less than 10 years to go from plastic discs to digital files. It will take 5 years or less to go from digital files to cloud-based services, which will make the music even more valuable." This is all good news. It's someone who clearly recognizes the shift that needs to be made by a major record label. But, the real question is how much influence he actually has at Universal Music Group. We've seen similar recognition among employees at other record labels, including Warner Music and EMI -- but the "top management" at both of those firms has continued to go in the opposite direction, focusing on stomping out innovation, rather than encouraging it. "Universal Music is a big company and not everyone there is on the same page, but I was put into this job to make these changes. Turning a big ship around is slow. It's not a lack of desire, but it's a question of when not if. A lot of what I do is talk and evangelize to others within UMG to try to raise the consciousness level about where our business is going, to bring us to a path to growth again. It's not about how do we stop the decline of our business, but to find another billion dollar business for us. I'm not interested in how to I sell more MP3s on Amazon or to create new competitors to iTunes. That's important, but that's not going to transform our business. It's difficult in the day-to-day grind to turn a big company around, but it starts with passion. Passion sells. This is how it works." It's great to see some optimism coming from within one of the major labels, recognizing all of the opportunities out there. Hopefully, it actually leads to something useful. In Trying To Capture The Moment, Do We Risk Missing It Altogether? Earlier this year, in writing about a musician complaining about fans with mobile phones in the audience, we noted that he seemed to be overreacting, but did raise some interesting points about whether people get so focused on documenting an event that they miss experiencing it. Now a columnist at the Toronto Globe & Mail, Ivor Tossell, makes a similar point in worrying about the effort he goes through to capture "events" like beautiful sunsets, when he's not even sure what to do with the photos afterwards. While much of the column focuses on the question of whether or not these digital momentos will last at all, an equally reasonable question is how many special moments are "lost" in the effort of trying to capture them with recording equipment. There they go again... A few weeks back, I suggested that Warner Music would be smart to promote Ethan Kaplan, who is VP of Technology for Warner Brothers Records (a Warner Music Group Subsidiary), because he seemed to understand that the real trick was improving the overall experience people had around music, rather than focusing so narrowly on getting paid for every single usage. At the same time, however, the folks up at Warner Music, led by Edgar Bronfman (who claimed Warner would no longer be at war with music fans despite being the guy who started that war) were going out and suing all kinds of services that made the musical experience better. As a record label, their job should be to get their musicians' music out into the world in the most convenient way for anyone to enjoy, and to build business models based on that -- just as Kaplan suggested. But, instead, Warner Music continues to be about as anti-consumer as it can possibly be. Its latest move is to have Last.fm remove all Warner Music from its service. Last.fm, which is now owned by CBS, is an exceptionally popular online music listening, discovery and e-commerce site. While it did overstate its "free" music service, it still is rather ridiculous that Warner would decide to take all its music and go home. Warner should recognize that it needs Last.fm a lot more than Last.fm users need it. There's plenty of music out there, and if they can't find Warner Music on Last.fm, they'll find someone else's music instead. Among folks who follow the news about copyright issues and online music, the band Metallica is rather infamous. After all, Metallica drummer Lars Ulrich was the first (and most vocal) musician to come out swinging about how evil Napster was. The band was the first to sue Napster (and some universities for failing to block Napster) back in 2000. It also spent many years complaining about iTunes -- though the band eventually gave in two years ago. However, this isn't to say that the band hasn't been willing to at least experiment with online music, often in somewhat creative ways. Way back in 2003, while other musicians were jumping on the iTunes train, Metallica did a surprising deal with DSL provider Speakeasy, offering Speakeasy customers who bought a Metallica CD access to other special content including "live recordings, demos, b-sides and other content." In other words, they actually gave people a reason to buy the CD -- but oddly targeted only at the small number of Speakeasy customers. Given that, perhaps it isn't that surprising that Metallica has now come out with a new website that tries to embrace online music. The new site, Mission Metallica, actually comes out of Ethan Kaplan's group at Warner Brothers Records. Kaplan is the guy we were talking about last week who is hopefully leading Warner in the right direction on music. As Kaplan notes, the important thing with the new site is that the music is part of the overall experience. The site (in some ways similar to their old deal with Speakeasy) offers a ton of additional content concerning the making of Metallica's latest album and various other things, like contests to win tickets to shows. It also puts in place many of the other aspects of the business model we've been discussing, including a tiered offering a la Trent Reznor and Jill Sobule. That is, the band is offering a variety of options to let people pay for actual value beyond the music. But... of course, it stops just short of actually making it all the way there. That's because the band isn't releasing any of the digital downloads for free. 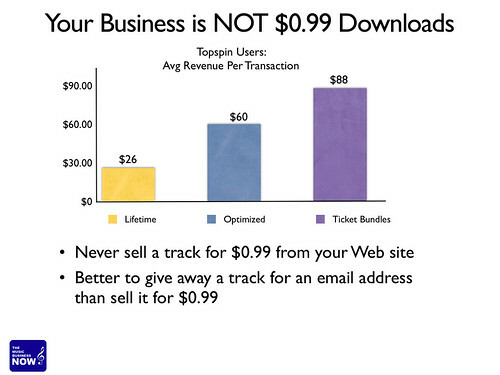 It still wants people to pay for the downloads -- even though freeing up those downloads would likely attract more people to all those other options (the band, obviously, would disagree, but given Metallica's reputation as being the slayers of Napster, they might be surprised at what a total shift would do for them). It's encouraging that the band has adopted many of the important aspects of recognizing the importance of the experience surrounding music, but it's disappointing that they haven't made it all the way through to the logical conclusion of where that model leads.